The GSTN will be completing one year of operation this month. How has the last 12 months been for your organisation? The last 12 months have been very eventful and transformative for the entire country. Before GST was introduced, 35 state and union territories had their own value added tax systems. They had their own ways of filing tax returns, laws and formats. Then there were central excise and service taxes. There were 37 disparate systems that hardly spoke to each other. Imagine a country of 120 crore people with more than a crore of dealers. Now they are all being brought under one digital platform. In the earlier system, the level of digitisation varied from state to state. Within a short span of time, all the 37 different items have been integrated into one. The entire return filing system has been made transparent and digital. It is a faceless system, where you can file digitally. How did you prepare for this challenging task? One was technology and the other was legal. Thirty-seven laws had to be brought under one single structure – the Central GST, Integrated GST and the State GST. Challenge was to take care of the different legal requirements. In a federal structure, the challenge was to maintain autonomy and bring all the states into one single platform. Look at the sheer technological scale of this operation. It has processed 357 crore invoices and 14 crore returns. Every month, 70-80 lakh returns are being filed. The number of people who can simultaneously log into our system is more than 1.3 lakh. This is a huge number in a country with different educational backgrounds. For example, the traders - not all of them are experts in information technology, but they are now able to file their tax returns smoothly and complying with all the GSTN requirements. When you are bringing about a change in any large system, there are bound to be issues. The software did require a bit of tweaking and creating awareness among people. For example,if you switch from an android phone to iPhone or from Windows to Macintosh, you will find it difficult to adjust for a while. People were used to the 37 different tax systems but we are now moving to a single system, so doubts and questions are natural. In the next four-five months, we plan to sort this out. The number of complaints being reported is far less today, and the system has kind of stabilised. On April 1 this year, we introduced the e-way bill system - first for the inter-state, then for intra-state. We had taken a batch of four-five states at a time. As a result, we generated about seven crore e-way bills between April-May – three crore for inter-state and four crore for intra-state. In the first week of June, we had already generated more than one crore e-way bills. On an average, we estimate that 15 lakh e-way bills are already getting generated every month. It will go up to four-five crore e-way bills every month. There are more than 1.14 crore new and migrated dealers in the GSTN system today. Even though it is one system, it is owned by the Centre and the states. 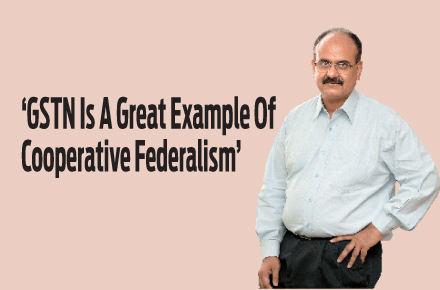 It is a great example of cooperative federalism. Do you think there was adequate training and education for GST roll-out? Before 1 July 2017, certain amount of awareness and education was done. In a large system like ours, it takes time for an idea to sink in and reach the last mile. No one can claim that all the 1.14 crore dealers were fully trained prior to July 1. A large section of people have been trained and more will be trained over a period of time. It could be due to lack of familiarity with the new system. A person filing returns in Tamil Nadu was using a certain system and had to switch to a new system. In the new system, there are two possibilities. One, the person is unfamiliar with it and could make a genuine mistake, but how can one reverse it? Second, GSTN has to take certain actions. While we work to reverse the mistakes, we had to ensure that the system is not misused. If you consider the total number of returns being filed and compare it with the number of people facing difficulty, by any standard, the number of complaints is minimal. How does one know if it is working? It is working because more than 14 crore returns have been filed. Whenever a large system is designed, we need to anticipate the kind of problems users will face. If I design a system that works well for 95 per cent of the people, there will still be some who face unknown difficulties. For us, each GSTN user is important and we have to solve his or her problems. Will GST filing be easy as filing income tax return? We are continuously evaluating to make GST filing simple. In the first few months of its launch, the forms were lengthy. For example, if there was no sale or purchase transaction in that (particular) month, why does one need to go through a five-page form? In December, we changed this and made them contextual. Can GSTN manage cyber-attacks and data theft? GSTN has a robust system and we take security very seriously. It has two aspects - someone enters the system to damage it and the other is denial of service because of a cyber-attack. We follow the best security measures in the world. The security scenario is however dynamic. What is secure today may not be good enough tomorrow, so we have to remain proactive and take measures to stop such attacks. Any plans for a new accounting software or app? We are working on this. Tax preparation software companies and tax accounting agencies are being explored and we may accredit or empanel them for the dealers. Earlier, there was a tax preparation software with separate accounting system for sales, purchase and invoices. The time has come to integrate both of them. What is your vision for the next one year and for the long term? We have undertaken a massive exercise for simplification of returns. The GST Council has taken a decision, whereby people can file only one return. In the next one year, it will be possible to upload invoices anytime whenever they get generated. The returns will be automatically prepared. All that the taxpayers need to do is click the required keys. The e-way bill system will also get stabilised. A huge data analytics will be undertaken, as it gives a lot of information. There are many honest taxpayers, and then there are others who do not disclose all their transactions. So all these outliers who are trying to cheat the system are identified and appropriate actions are proceeded or advised to bring them on the main track. This will lead to better compliance and increase in revenue.